He was simply the best of us. 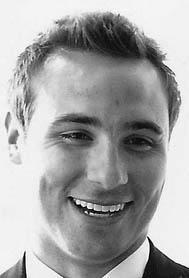 NICHOLAS A FREITAG ’01, age 34, beloved son of Jeffrey and Jane Freitag of Long Beach, died Tuesday, July 2, 2013 at Mayo Clinic, Rochester, Minn. He fought courageously to his last day against his incurable cancer, metastatic melanoma. A private family service was held, with cremation following, in Minnesota. Nick is survived by his parents, his brother, Tony (Randi) Freitag, the love of his life, Kirsten Solberg, aunts, Mary Reed and Ann (Ray) Hager, uncle, John Freitag, his dog, Tegan and his many steadfast and dear friends. Nick was born in Michigan City, Ind. on April 7, 1979 and was a graduate of Michigan City High School; Princeton University, where he was a member of Cottage Club and the varsity football team; and Georgetown Law School. He was most recently an attorney with Freeborn & Peters, LLP in Chicago, Ill. In memory of Nick, donations may be made to the Nick Freitag Memorial Foundation via Nick’s tribute page at www.crowdrise.com/nickfreitag or to the family, with all monies directly funding melanoma research.